More Tide Charts — Now Available Coast to Coast! If the tides for your harbor are not listed here, our national website, USHarbors.com has detailed tides and weather for over 1,200 harbors in 22 states — perfect for making sure you stay on top of the tide (literally!) on your next cruise up or down the coast. 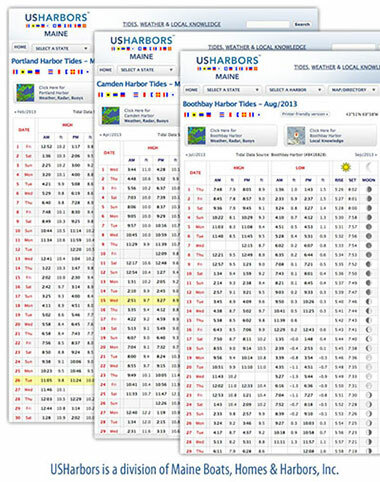 While you’re checking the tides, make sure to check out the other information on USHarbors.com — pinpoint weather forecasts and conditions for 1,200 harbors coast to coast, business listings for hundreds of the finest coastal companies, and a steady stream of Local Knowledge for your favorite harbors. No matter what part of the coast you love, USHarbors.com is the one site you’ll want to check every day!